Quick Meals – Round 2! When I was a kid, we had “breakfast for dinner night” at least once a week. As a child, I thought my mom was being creative…maybe even a bit daring – breaking all the meal time rules. As an adult, I know the truth. It was fast, cheap, full of protein, and everyone would eat it. We have breakfast for dinner at least once a week around here. What used to be pancakes and sausage or french toast and eggs is now far more protein packed, and entirely lacking in fluffy goodness, but still delicious. 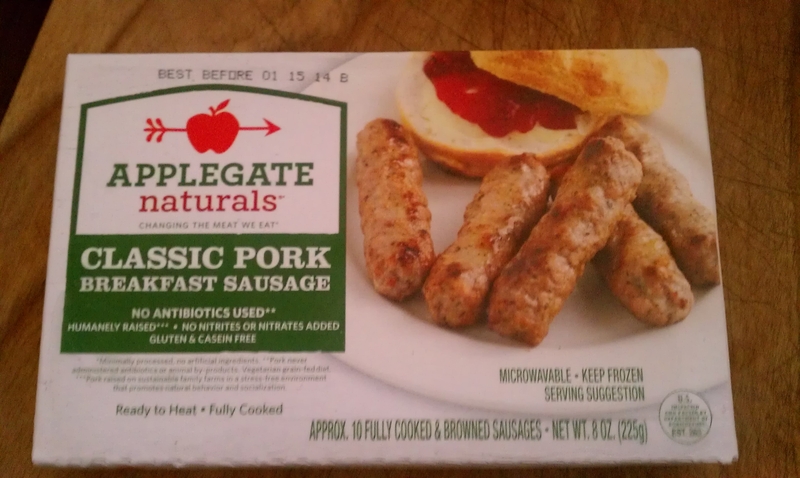 Quality sausages made by a reputable company for $1.49? Yes please! These puppies sell for $5.99 at my Whole Foods so I did not hesitate to buy a huge stack of them. If you have a Grocery Outlet near you, check it out. It’s not at all what it used to be. Great way to provide awesome food to your family on a frugal budget. These sausages are pre-cooked, so all you have to do is crisp them up. While they were frying, I scrambled up a dozen organic, free-range eggs (I’m feeding five here!) in some good quality butter…and yes, some sausage drippings. My CSA has amazing eggs, but I missed out on them this week, so I grabbed a dozen from my mama’s backyard hens. If you don’t have access to free-range eggs, organic is the next best option. Grocery Outlet usually has those, too! 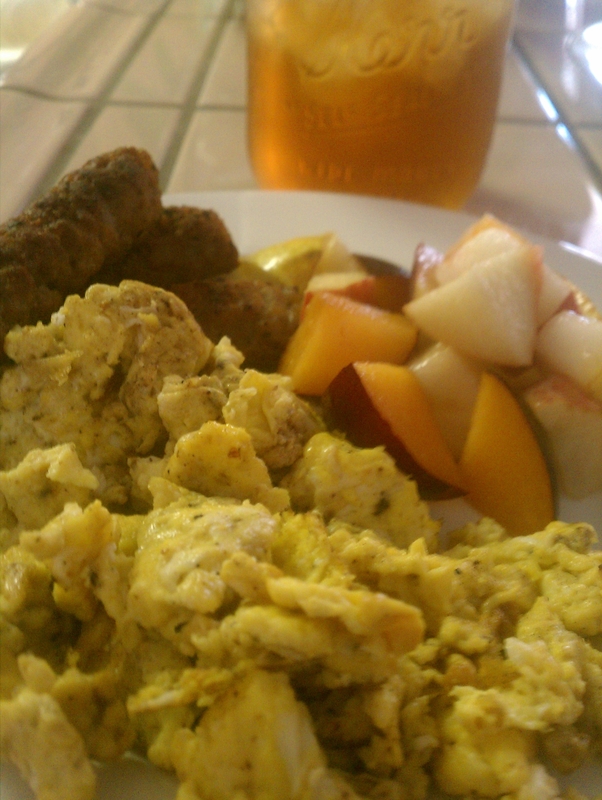 I chopped up some seasonal fruit from my CSA box, served up some iced mint tea, and called it dinner. I always serve eggs with some of my fresh salsa too. It adds loads of flavor, and is a great way to toss in a few extra nutrients for everyone. I am realizing more and more how valuable it is to preserve things from my box each week. A little salsa in the freezer, a little mint, dried and stored in a jar. Little by little, I’m finding ways to not only extend the life of my food, but ways to plan ahead even more than I already do. This girl loves a potato. And breakfast for dinner night. Unschooling, Urban Homesteading, Happily Married, Mama to three. Always in the kitchen, at the library, or in the dirt.